First, let me be clear that these are not mine. I simply collected them, made sure (most of) them work and bundled them up. I hope the crediting is adequate. Anyhow, I am not the owner of any of this; it was collected from pubic sites years ago and I just found it in my files and hadn't seen or heard of some of these creations. A collection of Mods for UT made by Russian fans, most notably by Stvaan Ivanhoe. Most of these mods (are they mods? I guess so, but they are more like campaigns) have credits listed and many notable and well-known names appear as mappers and contributors (DavidM, for example). I put this together simply because it seemed like some pretty good content - if not a bit ambitious at times - and I hadn't seen it around in my time on the various forums or UT-related file hosting websites. It may be new, maybe old, but it's certainly Unreal. I won't tell you about the mods/campaigns in detail here because I'm too lazy to do that much typing. They are single-player (maybe co-op?) games with loads of work put into them. But it's all Russian, so I have no idea about the story...I'm playing as a tourist. They do seem at times to be a patchwork of other mods and assets but I'm no expert on those matters. Anyhow, if you see your work in there, don't blame the messenger. You'll need to have OldSkool v2.38+ installed and some of the mods seem to depend on other mods being installed. There are .htm files in most of the "help" folders of the various packages that will give you some indication of what needs to be installed (although it is all written in Russian, one can make some sense of what it needs to get going). "Second journey of Na'Garuuk" (SJoN) needs Nali Chronicles Part I to be installed, for example. Everything has an installer and the ones I have tested seem to work fine. Some packages and games are more temperamental than others; some need to be launched with a .bat file that will be generated when installing. 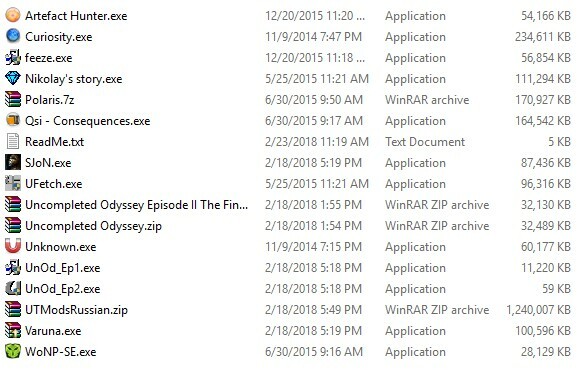 7zip can open all of these as archives, so if you want to do a manual install, that's how. Copy the files to the appropriate place, but I'm not sure about the overwriting certain files, so I didn't allow them and all was well. I have these installed on a 436 installation, with extreme-end textures and all manner of tweaks, maps and mods and all of the included packages run without issue. These urgently need translations if they're as good as you say. I heard of Wanderer of Na Pali so it maybe already has an english version.